From The Works of Aretino, Translated into English from the original Italian, with a Critical and Biographical Essay by Samuel Putnam, Illustrations by The Marquis de Bayros in Two Volumes, Volume I., Chicago: Pascal Covici, 1926; pp. 95-112. That is what her shop has to sell. 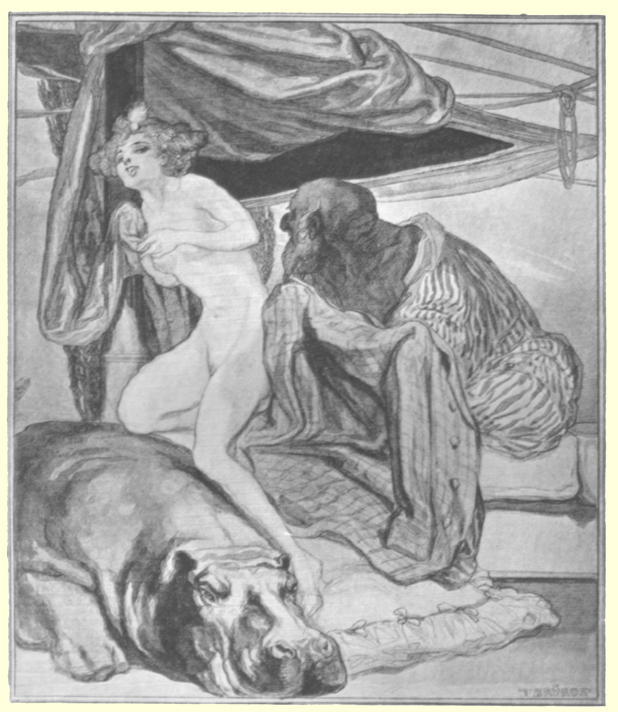 The Third day of the Capricious Dialogues of Aretino, in which Nanna recounts to Antonia the Life of Prostitutes. And in the morning, he gave me a dress of glorious old satin. NANNA: I had a certain lover, a merchant and a good fellow, who not only loved me but adored me and supported me; and I certainly showed him a good time, not being at all crazy over him.1 And one day, I told him that some courtezan or other was dead over such and such a one, which was not the truth, for we courtezans are merely the victims of caprices which seize upon us occasionally and make us want to eat a great handful; but these caprices last only as long as the sun of spring or the rain of summer, and it is impossible that she who submits herself to everyone should love anyone. ANTONIA: That I know well enough. NANNA: Now this merchant I am telling you about was sleeping by my side one night, when I, to give myself a reputation in his eyes, and to cook his goose,2 decided to make him right gallantly jealous, although he made a profession of not being so. And how will you do it, Nanna? I said to myself. I decided to buy a couple of starlings and a pheasant, and I hired a ragged fellow who was not known to my lover to come beating on my door at dinner time, knowing the merchant would be eating with me at that time; and having told my maid to open the door, lo, up he came with a “health to your Ladyship,” adding: “I am the messenger of the ambassador of Spain, who begs that your Ladyship will deign to eat these little love trifles, and that when it is convenient to you you will deign to give my master five and 98 twenty words.” I rebuffed him, saying: “Ambassador or no ambassador, take them away, for I do not care to have any ambassador speak to me except this one, who is better to me than I deserve.” And when I had kissed the old simpleton and turned threateningly on the ragamuffin, who took his departure, the merchant said to me: “Take them, you silly girl; take everything you can get.” And saying to the ragged fellow, “She does not want any love of yours,” after a few laughs, which did not sound just right, he remained quite beside himself, and I, going up to him and shaking him, said: “What are you thinking of? Not the emperor, much less his ambassador, shall have so much as a kiss from me, and I think more of the soles of your shoes than I do of a thousand thousand ducats.” Whereupon he, sufficiently reassured, went about his business. 1 Ed io certissimamente lo accarezzava, non essendo guasta di lui. 3 The “Mon homme” theme was popular then as now. You gave him a dose of his own medicine there. ANTONIA: You gave him a dose of his own medicine there, ha, ha, ha! NANNA: He put his hand into his purse and tossing them out said: “Take them, master, and go, for God’s sake.” And when I kicked the lock as though I wished to break it open, he said: “Send for a locksmith and have it opened, for there is no hurry.” And he gave me a “thou,” as though I, all of a sudden, had become one of his servants on account of the aid he had given me. NANNA: Leaving him to cool his heels I threw myself into bed with the intention of not giving him a billfull that night, and as soon as he had taken me in his arms, there came a loud pounding at the door, which I had been expecting, to annoy him. I rose up, although he tried to draw me back, begging me not to go see who it 102 was beating at the door; and while he was eaten up with jealousy, I looked down and saw that it was a little Monsignor with a cap thrown back over his cloak and sitting astride a mule. He called up to me, offering me his crupper. I accepted it, and taking the cloak from his groom, since the lad had other clothes beneath it (the ones he always wore), I went with him. And then this business agent of whores as well as of men, tearing down out of spite a portrait of mine which was on the wall of my room, took his departure like a gambler from a swindle shop, perceiving he has got the worst of it. But I forgot to tell you, he broke open the chest to get his money, but my maid ran crying through the street and a great crowd gathered, and he was compelled to flee, undressed as he was. As for the chest, which he forced, he found there only a few unguents and ointments which I was keeping against certain evils to come. They have made a comedy out of my simplicity. NANNA: There came to Rome a young man of twenty-two years, noble and rich, a merchant and of good name, a proper pasturage for whores; and no sooner had he come than I laid hands on him, pretending to be truly in love with him, and the more he minded his own business, the less I minded mine. I commenced to send my maid to him four or six times a day, praying that he would deign to come to me, until it came to be generally believed that I was all minced chicken and holy oil over him.1 And so it was, everybody was soon saying, “The whore has met her match this time; she’s met one who will make the milk stink in her mouth, and who can make her crazy simply by staying with her for an hour.” And I let it be thought that I was becoming skin and bones for him, pretending that I could not eat or sleep, talking always of him and always sending for him, until they even laid bets that I would go to the tomb, dying for the love of his beautiful eyes. The young fellow, getting out of it a few good nights and a few good dinners, went about boasting, showing everyone a turquoise of small value which I had given him; and when he was with me, I would always say to him, “Never let yourself lack for anything for want of denarii, and never go to anyone but me, for all I have is yours, just as I myself am yours.” For this reason, he went strutting among the Benches, letting everyone see the ring on his finger; and it happened that when 104 he was with me one day, there came to see me a great old lord, and I hid the young man in a neighboring room and locked him in. The lord came up and, sitting down, his eye caught sight of some linen sheet or other. “Who soils that?” he said, “Your Ganymede? Or Canymede, I don’t exactly remember which.” And I replied; “It is certainly he who soils it, and I love him and adore him; I look upon him as a god, and I am his servant and shall be for eternity, making love to you others only for the sake of your money.” You may imagine how puffed-up the young chap was when he heard this; and as soon as the other was gone, I ran to let him out, and when he came out, his neck was too big for his shirt, and strutting up and down, he lorded it, with haughty looks, over me and the servants and my house. But to come to the amen of my paternoster, one day, when he wanted to throw me across a chest in his usual manner, I left him and went out with another. He, being used to jokes like this, and used to adjusting his cloak to the wind, did not run after me, expecting that I would send for him as I usually did; but when he did not see the dove of peace appear, the very devil laid hold of him. When he came to my door, he was told, “The Signora has company”; whereupon he stood there like a fly in oil, with his chin on his chest, with a wry mouth, with lips drawn and melting eyes, his hat askew and his heart beating pitty-pat, his legs trembling like those of one who has just gotten up from a sick bed. And I, seeing that, under the plasters of jealousy, he was about to have a chill, laughed at him; and when someone greeted him, he replied only with a little raise of the head. When he came back that evening, I let him in and then returned to gossip with a large company which I had. Seeing that I did not ask him to be seated, he took the liberty of seating himself, and taking up his post in a corner, without enjoying all 105 the pleasant things which were to be heard, he stayed till everyone had gone, and then, alone with me, he said: “Is this your love? Are these your caresses? Are these the protests you used to make? I replied: “My brother (by your leave), I have become the talk of the courtezans of Rome, and they have made a comedy out of my simplicity, and what cooks me more than anything is that my old lovers no longer want to give me anything, saying, ‘We don’t want to buy the bone while someone else eats the oiled bread.’ And in case you want me to be the girl that I was, and that I have been to you, there is one thing you can do.” At these words he raised his head as one does who is about to escape justice, swearing that for love of me he would give his eyes to the fleas. I had but to open my mouth and ask. And then, I said to him: “I wish to get a bed of silk, which costs, with the fringe, with the satin and the bedstead, without the cost of making, in the neighborhood of a hundred and ninety-nine ducats; and since my friends see that you have more than enough, and since you have promised to give me what I wanted, get it all on credit, and when the time comes to pay, leave that to me; I will see that they are paid or split.” But he said: “I cannot do this, because my father in his letters has let it be understood that I am not to have any more credit, and that whoever gives me anything must do so at his own risk.” At this, I turned my back on him and showed him out of the house. One mid-day when he was with me, I said: “Go find Solomon, who will provide you with the denarii on a writ of hand.” He went, and when Solomon said to him: “I cannot lend them to you without security,” he returned to me and told me the whole thing, and then I told him: “Go to such and such a one who will give you jewels for the said sum, which the Jew will be gracious enough to take.” So off he went, and having found the one with 106 the jewels, he gave him his note for two months, and carrying the jewels to Solomon, he sold them to him and brought me the money. ANTONIA: What did you have to say to that? NANNA: The jewels were my own, and when he had got his denarii back, the Jew brought them back to me; and after eight days, I sent for the one who had given the jewels on the writ of hand and said: “Have the young man thrown into prison and swear that he is a suspected fugitive.” This order being carried out, the simpleton was taken, and before he got out, he had paid double for his meals, for those old hosts are not in the habit of giving free meals to a sponger. 1 che io ero al pollo pesto, ed a l’olio santo per lui. I’d wager my soul against a pistachio nut. NANNA: And now we come to the one about the cats. ANTONIA: What cats might those be? NANNA: I had a debt of twenty-five ducats which I owed to a certain cloth vender, and having no thought of ever paying them, I was looking for a way of giving him the birdie.1 What did I do? I had two cats that were pretty enough, and when I saw him coming to my window for the denarii, I said to my maid: “Give me one of the cats and you take the other, and as soon as the old weaver gets here, I’ll cry out, and then I want you to pretend to choke it, and I will do the same with the one I have in my hand.” I had no sooner said this than there he was. ANTONIA: Didn’t he knock at the door first? ANTONIA: Nanna, I want to tell you a fancy I have. NANNA: Tell it to me. ANTONIA: This pretty story about the cats is such a gentle one that for love of it you shall be pardoned for four of those excommunications of yours. NANNA: Do you believe it? ANTONIA: I'd wager my soul against a pistachio nut. As I understand it, the vices of whores are virtues. NANNA: Oh, oh, oh, but I’ve got a bad cold; oh, oh, oh, this fig-bush of mine certainly hasn’t known how to keep the sun. This is no time to tell you of the many men I wheedled out of fate, making them believe that the Synagogue of the Jews was in the air, after the manner, so it is said, of the arca di Macometto. Oh, oh, I can’t breathe, I’m hoarse already, this cold makes my uvula drop. ANTONIA: It’s the walnut, not the fig-tree, that casts a sorrowful shade. NANNA: I want you to give me your advice in three words, as you promised — I’m choking, Oh, oh, oh, I’m sick. I feel worse about not being able to tell you how I reformed my lovers than if I had lost I don’t know what. Pretending charity toward their purses, I never let them spend their money on embroidered clothes, fine dinners, or useless things. And I did this because their denarii would better serve my own appetites, and the clowns thanked me for my discretion and for being so considerate of their pocketbooks. Oimè, I’m splitting, oh, oh, oh; I’m pained also at not being able to tell you that one about the espaliers, who pawned them, who had them in pawn, who bought them for me, of the two who were present when they were bought, of the one who brought them home for me, and of the one who was in distress while they were being set up in the house. ANTONIA: Go on, force yourself to tell me. Go on, please, Nanna, sweet Nanna, dear Nanna. NANNA: It happened that Master — help me say it — Master, Master — I’m dying, this is no place, pardon me if I tell you some other time — that one, too, about the Monsignor who fled naked over all the roofs in the street — Oimè, — I’m in a fit, Anto — Antonia mine — kerchoo! ANTONIA: A curse on your cold, and on that gentle creature of a sun who has spoiled your conversation. Perhaps I ought not to tell you, but it was hardly to be believed you should have seen such things as you did on the very first day you entered among the nuns and that you made yourself so at home with the bachelor at the very start. NANNA: I tell you, I became a Sister when I was still half a girl. And as to my having seen such foolish things all at once, you may believe me, I have seen far, far worse — damn this cough — kerchoo! NANNA: Yes, yes. But give me your advice in three words, as you promised. ANTONIA: To come back to the promise which I made you, that I would sum the matter up for you in three words, I cannot keep that promise. NANNA: Why? Eh, eh — kerchoo! ANTONIA: Because it was a thing which I could do at the time I told you I would do it, but not now; for we women are wise when we act without thinking and mad when we stop to think. But I will give you my advice, and you may take the rose and leave the thorn. ANTONIA: I will say that, having made an allowance for a part of all you have told me, I believe the rest, for there is always a little falsehood mixed with the truth, and 111 sometimes, to make our conversation prettier, we tinsel it out with gewgaws. . . .
NANNA: When did you ever catch me in a lie? ANTONIA: Not in a lie, but in a little neglect in your conversation, and I am inclined to believe, moreover, that you have it in for the nuns and the married women; though I must give you the credit of saying that there are a good deal worse ones among them than there ought to be. As for whores, I take no account of them. NANNA: I can’t answer you, and I’m afraid this cough is going to become a catarrh. Be gracious enough to hurry and give me your advice. ANTONIA: My advice is that you should make your Pippa a whore, for the nun betrays the sacrament, and the married woman assassinates the sanctity of matrimony; but the whore attacks neither the monastic life nor the husband; she is like a soldier, who is paid for doing wrong, and doing it, she is not to be held for so doing, because that is what her shop has to sell, that is what she has to sell. On the day when a landlord opens a tavern without putting up a sign, it is understood that one goes there to drink, to eat, to gamble, to bawdy, to curse, and to deceive, and that he goes away to say his prayers or to fast. But in the place itself you will not find any altar or days of Lent. The gardeners sell their vegetables and druggists their drugs, and the brothels sell blasphemies, lies, gossipings, scandals, dishonesty, thefts, filth, hatred, cruelty, death, syphilis, treasons, ill-fame and poverty. But the confessor is like the doctor, who can more readily cure a disease that shows in the palm of the hand than one which does not. And so I would advise you to make your Pippa a prostitute at the first flight,1 since any penitent lady, with a couple of drops of holy water, can wash away all whorishness from her soul. As I understand it, 112 from what you have told me, the vices of whores are virtues. Beyond this, it is a fine thing to be called Signora, even by Signori, eating and dressing always like a signora, holding a continual feast and marriage day, as you yourself, who have told me so much of them, know better than I do. The important thing is, that she should not form a whim for anyone, since Rome always was and always will be — I will not say the city of whores, for there is no need of my confessing that.